A castle where the ghost of a boy was apparently seen holding visitors' hands without them noticing has been voted England's spookiest. 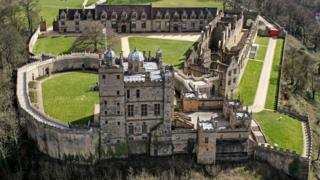 English Heritage (EH) staff gave the verdict on Bolsover Castle in Derbyshire, which is built on an ancient burial ground. The 1,800 EH employees rated the site they work at on a "spooky scale". Other events at the ex-home of William Cavendish, include strange footsteps and slamming doors, EH reports. People also said they had felt like they were being pushed, had cold sensations and heard muffled voices. EH looks after 400 castles, abbeys and historic houses nationwide. Security guards said they have seen unexplained lights at the castle and one woman claims she heard a scream as she was locking up, only to find no-one there. Image caption Kenilworth Castle was rated second in the "spooky poll"
The 900-year-old Kenilworth Castle, in Warwickshire, came a close second in the "spooky poll". Staff said they have encountered ghostly figures, an antique cot rocking by itself and the smell of pipe smoke. Carisbrooke Castle, on the Isle of Wight, whose deep well was the site of a young girl's drowning, is believed to be haunted by several figures. Employees said they often heard the sound of children laughing in rooms. Lucy Hutchings, of EH, said: "Our sites are soaked in history and from bloody battles to dark deeds, not all of their stories are sweetness and light. "Our castles and palaces... can be eerie places and some of our team have seen and heard things they can't easily explain."